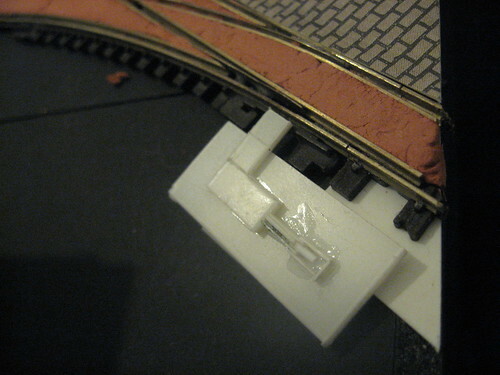 For a current project, I need a turnout lever suitable for inlaid track. In this case the lever must be flush with the road surface when not in use so as not to cause an obstruction. 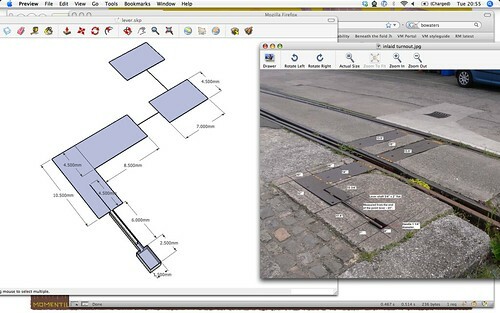 Some time ago while planning the piece, I saved off an image from the RMweb forum where someone* had photographed and dimensioned just such a device. To scale the lever for use in OO9, I made a quick rendering of the main parts in Sketchup, which is a great tool for this kind of visualisation. You can draw to scale, and apply dimensions to the drawing which made for a reference on-screen when I started chopping styrene. One thing a few numbers on a screen doesn’t get across is just how small this thing turned out. It looks reasonable scaled up on a 15″ laptop screen, but when you’re trying to glue together a 1.5mm x 2.5mm box made of 0.2mm thick styrene things get a little trickier. In the end I stuck the whole lever to a base strip of 1mm styrene and built up the detail on that. The base will be concealed by the concrete infill around the lever anyway. * Unfortunately I can’t remember who, but thanks for the useful data! This entry was posted in 009, model railways, narrow gauge, scratchbuilt. Bookmark the permalink.